Last year I left all the honey in the hives for the bees to use over the winter. This year however, early in the season I found almost a whole box of honey plus some more stored in the box below....so, some for me and some for the bees. Typically beekeepers use a langstroth type of hive with frames that either have wax or plastic foundation on them. To collect the honey they use a hot knife to slice off the thin cappings on both sides of the frame, then put several frames in a spinning machine to use centrifugal force to spin the honey out of the comb. In my case however I'm using Warre hives. The bees start with nothing more than a top bar from which to hang their comb, so I use the crush and strain method to separate the honey from the comb, not nearly as pretty but it gets the job done. 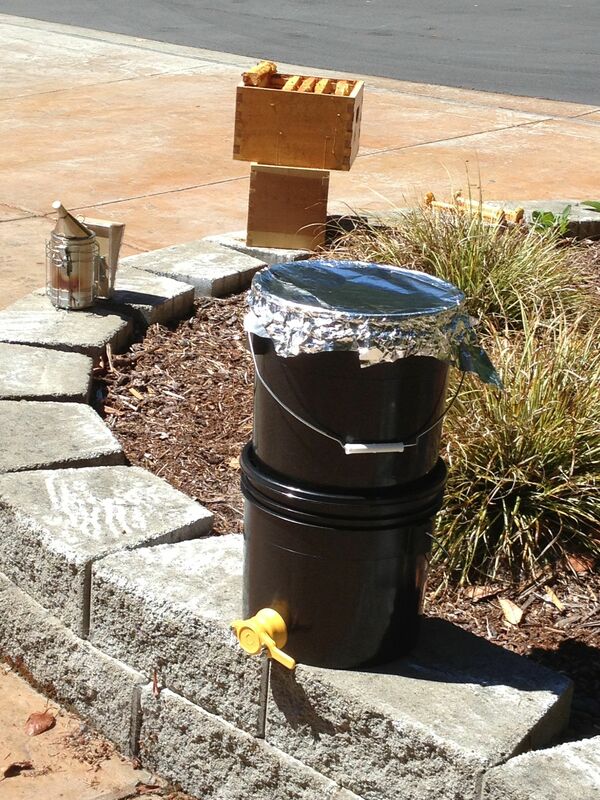 Step one is getting the bees out of the box of honey you want to collect. I put a bee escape below the box I wanted to collect. Check out this blog post for more details on that. I left it in place for about 10 days. Most of the bees were gone but there were some die hards that just would not give up the honey. No worries I was able to gently encourage them out as I pulled the frames. Next I found a big white bowl (color doesn't really matter) and a wooden spatula to do the smashing. I cut the comb off into the bowl (I did this away from the apiary as once the bees get the scent of honey you will be over run.) and began smashing it up. It really looks like a mess.....this is the "Crush" part of crush and strain. 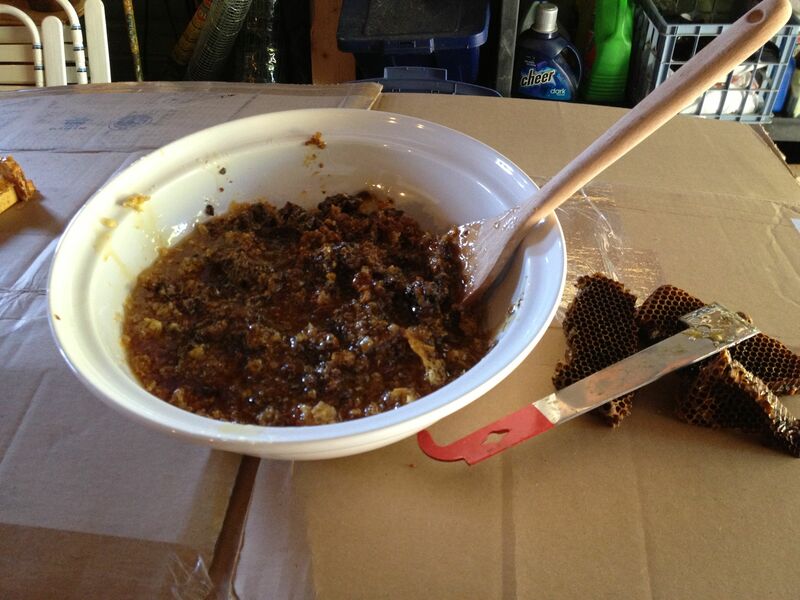 Next I poured this sticky mess of honey and smashed wax into my separating system or you could also call it a Honey Bucket, not the kind you see on a construction site.....a real....honey.....bucket. This is two buckets stacked on one another. 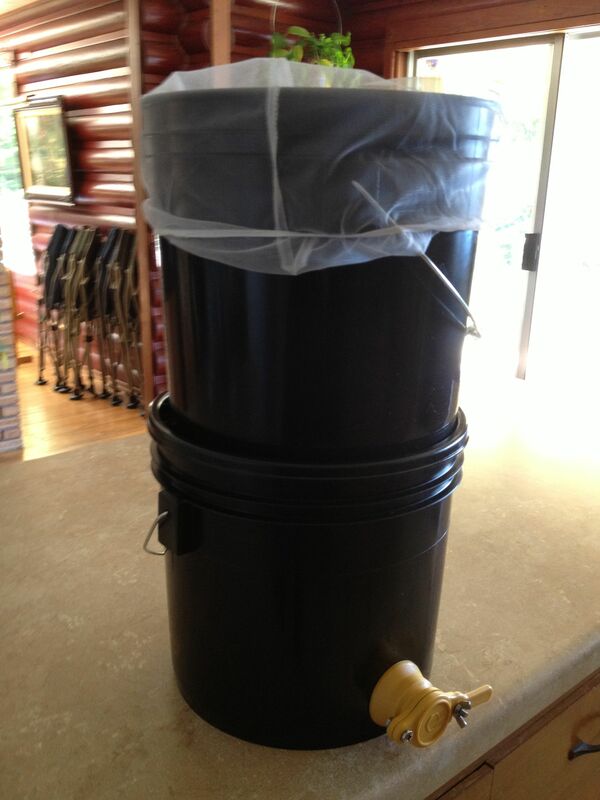 The top bucket has a nylon straining bag in it and has holes drilled in the bottom. the bottom bucket has a lid with the center section cut out of it to allow the honey from the top bucket thru. It also has a honey gate....or valve at the bottom. This system is the most natural way to collect honey as there is no filtering of the honey which could filter out pollen or other great nutrients the honey might contain. Here is a link to a couple of similar systems: Mann Lake - Brushy Mountain Bee Farm - BeeThinking. I got mine from BeeThinking. Now, time to put the buckets out in the sun. Warm honey flows much better to the bucket below. ***Big note here --- When I do this again I'm going to wrap saran wrap around the seam between the two buckets. There is just enough space for bees to get in and I had to scoop several out who got in and could not get out**** By the next day all of the honey had moved to the bottom bucket leaving all of the crushed wax....and other goodies in the mesh bag above. Now the fun part, pouring the honey into the jars. 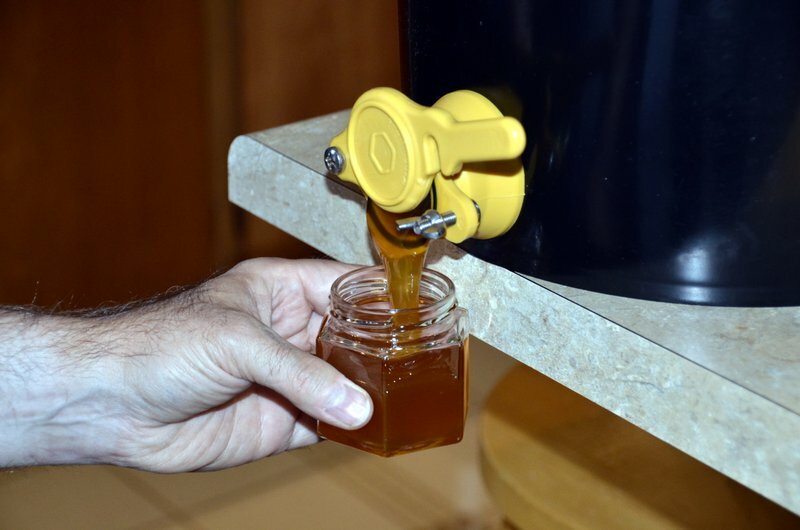 There are lots of choices when it comes to honey containers, jars and bottles which you can buy from most of the beekeeping suppliers. From here just make sure each jar has its cap screwed on tight and wiped down so there is no stickiness on the outside. Design and place a cool looking label on the outside and we are ready to roll. Couple of notes; I did wash all of the jars before using them. Honey attracts moisture so if you can do much of the work in an air conditioned space the better. Too much moisture in your honey and it will spoil. 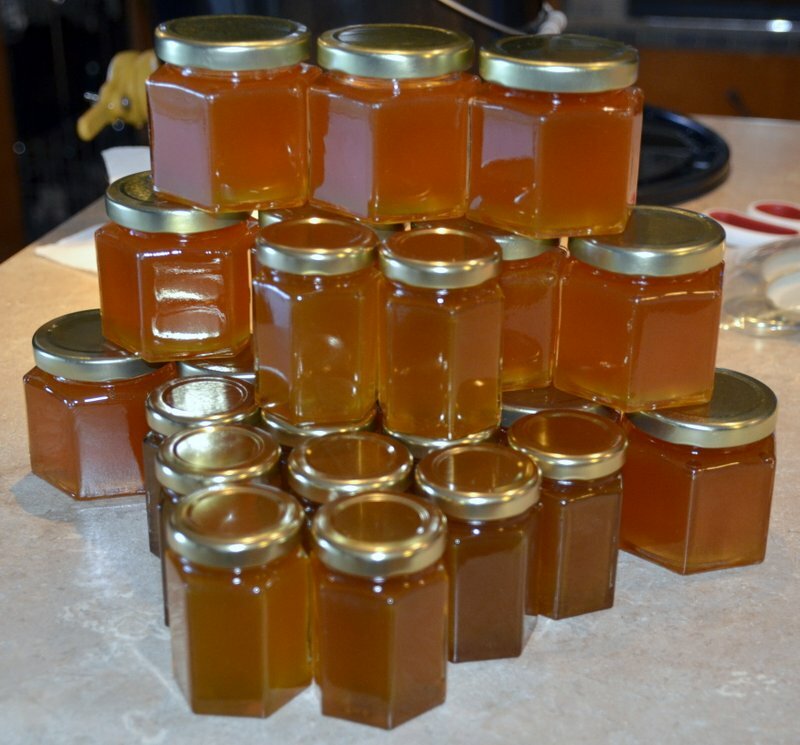 All told this first harvest was about 17 pounds of honey. 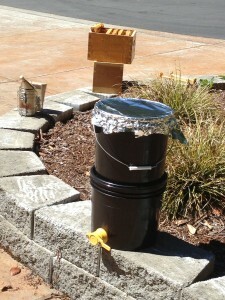 The first of the honey went to our bee friendly neighbors. That sounds like a lot of honey but as you can see not many jars. I took the wax and melted it down and turned it into candles....I'll share that process in my next blog post. Hi Frank, How exciti9ng to harvest your own honey and especially after the length of time. I love good raw honey and it is hard to find. Your jars looked so professional! !